The day provides students who are members of their respective Catholic campus ministries with the opportunity to learn about the role of the Church in the public square and how Catholic social teaching is applied to public policy. After an informational session in the morning where they had breakfast with the FCCB staff, students spent the remainder of the day at the Capitol touring the building and sitting in on a committee meeting to watch the legislative process in action. Danny Burgess, Dept. of Veterans&apos; Affairs, (above left) and Rep. Amber Mariano (above right) visit with Saint Leo students and FCCB staff. The three students met Danny Burgess, executive director of the Florida Department of Veterans&apos; Affairs. Burgess served as state representative for District 38 in which St. Leo University is located until being appointed to his current position by Governor DeSantis in January 2019. 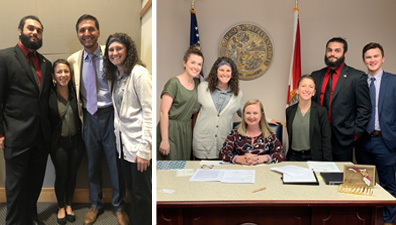 The students also visited with Representative Amber Mariano (District 36, Hudson) whom they had previously met when Mariano visited Saint Leo. The students were urged to share their experience and the knowledge they gained on the work of the FCCB with their campus ministry peers. They were also encouraged to connect with the Florida Catholic Advocacy Network as a means to stay informed on the Church&apos;s ongoing engagement in the policy arena and take action on specific policy proposals under consideration.